one lucky winner will get a $100 gift certificate! the jewelry from blush envy is simply gorgeous. i can't really write any words to describe it, i think you can only see through pictures and i am sure in person these pieces are all the more beautiful. brandy's lovely shop is brand new (just created in may!) but she's already made it to the etsy front page! she creates the most amazing pieces and has a great eye for photography too. i love all her unique clay floral pieces - the bib necklaces are definitely my favorite. this week, brandy is generously offering a $100 to anything in her shop! sorry to our friends in other countries! Hello, please tell us a little about yourself: Hi! I've been in the product design business for what seems like forever-all kinds of products from holiday to wedding to kids rooms. I come from a large family, and we were pretty poor growing up-something I'm grateful for now. "Whaaat" you say-lol! Yes, I am grateful! It gave me opportunities to dig down deep and tap into the ingenuity, resourcefulness, and creativity passed down through the genes of amazing parents who had no choice, but to stir up those gifts in themselves. But how incredible they are is a whole 'nother story~ for now let's just say, I'm eternally grateful to them and grateful to God that when you let Him work it out-even the ugly can become beautiful in your life. How did you get started making your lovely jewelry pieces? Necessity really - I have to make a living and am a terrible employee-scratch that, I'm an excellent employee-I just have no desire to be one anymore. Once you work for yourself, it tends to ruin you for other opportunities of employment-lol. The jewelry has been in my sketchbook for a while, just waiting for a chance to come to life- I had been doing bouquets for Brides, but it was wearing me out quickly. The work was extensive, tedious, and extremely costly. In the end I wasn't even breaking even. It wasn't an end, but a beginning-the opportunity my sketches had been waiting for. Any advice for aspiring small business owners? 1-Keep your sense of humor in tact. It's such a privilege to work for yourself, but you chance burning out faster doing it than anything else because the commitment is so huge. It takes ten times the time, effort, hours and money to make it happen. If you loose your joy-you loose. 2-Surround yourself with encouraging people who have succeeded! This one is so important- you can never learn enough to become better at what you do. If you don't have supportive family, don't use it as an excuse to feel sorry for yourself- get out there and make friends with successful people in your town. Get involved, start friendships and learn their secrets...you'll find that most people are very willing to help you as long as you're willing to put in the work to make the changes and grow! Find the business networks-they are full of resources. Your product, your work, your art isn't perfect and can always be improved-so take the criticism and grow! 3-don't get stuck in a rut! Grow, move, change...be flexible! Time moves forward and so must we as business owners, or else what we offer gets stale-yuck! with your favorite item from glenda's shop. is #35, kelly! check the winner's page for a list of all winners. Oh Gosh, Oh Gosh, I have to DECIDE?! They're all gorgeous! They look like fresh floral arrangements! Completely fantastic...uh..uh...my favorite...uh...Paper Ranunculus Rose Floral Necklace. Paper Rose Ring in Snow is to die for :) beautiful collection. Wow, I've never seen such unique stuff before. If I have to choose, I'd go with the Paper Rose Floral Ring Burnt Gold. I would LOVE the Paper Rose in Jade. So simple. So stunning. I love the Daisy Chain necklace. Overall, the collection is absolutely beautiful and unique. I had the hardest time deciding between either the Ivory Pearls on a Pendant or the Paper Rose Ring in Ink Blue and I know I have to choose the ring, one because i love love love rings and two because I have fallen in love with this one! It's so cute and can go with so much stuff! I love the paper rose necklace in jade! So beautiful!! i love the Grass Green Paper Rose Floral Ring so pretty. mmm...i love the daisy chain with the greens/yellows/blues...such lovely things! Love the paper rose rings and the rianunculus necklaces! My favorite is Classic Green Envy Pearl Necklace ! i really like the golden lotus blossom necklace. it's a very interesting pendant and is a gorgeous color! i love the daisy chain necklace in aqua! My favorite is: Secret Garden Paper Rose Bib Necklace In Pool and GrannySmith! thanks for a chance to win! i'm a google follower of you! I love the hined garden roses necklace - simply beautiful! I love the Paper Rose Floral Ring. Beautiful stuff! I can certainly see why she made it to the front page in such a short amount of time! I love the Paper Flower Rose Choker Boudoir Vintage Style. Gorgeous! I'm an earrings girl, through and through, and I love the Dots Modern Earrings. Gorgeous jewelry! The bib necklaces would also be beautiful statement pieces. love the Dots Modern Necklace. Simple and sweet, indeed! classy and elegant, not too showy but totally cute with a simple white tee. I love the daisy chain necklace and the rosebib hinged necklace as well. Lovely! 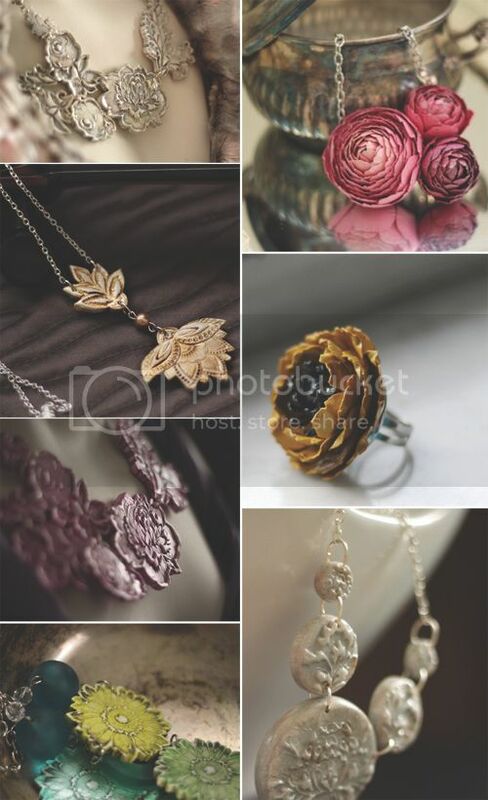 My favorite item is the Paper Ranunculus Rose Floral Necklace. So pretty! Hoping to win! OH! LOVe everything on there, ESPECIALLY the Ranunclulin pendant in coral blush OR the green envy pearl necklace. How would you decide! what a delicious giveaway. this jewelry is so unique! Love her works! My favourite has to be Modern Triple Bud Necklace in Island Waters. My favourite is the Lotus Necklace in Grass and Coal! I love the Secret Garden Paper Rose Bib Necklace In Pool and GrannySmith. GORGEOUS! I think I would drape it across the corner of a picture frame in the living room instead of wearing it though. It's a work of art for sure. what a beautiful shop! i LOVE the classic green envy necklace! so cute!! and of course i follow your wonderful blog!! Seriously, I have to choose just one? Then I want the Paper Ranunculus Rose Floral Necklace, it's my favorite. Love the paper rose ring in burnt gold! oh so difficult to choose!! The modern daisy chain may be a favourite!! Love the "Rose Bib Hinged Necklace." How beautiful! I love the Secret Garden Paper Rose Bib Necklace In Pool and GrannySmith. I LOVE the Lavish Bird on a Wire Necklace! Of course the garden bib necklaces are all gorgeous! I also love the paper ranunculas. I think the daisy chain necklaces are my favorites, but it's so hard to choose! I'm a follower of your blog through Google. Hinged Bib Rose Garden Necklace gets my vote...so pretty! Oh definitely the paper rose necklace in jade green...lovely! What a gorgeous shop and a talented woman! I adore all of the paper rings! I would take one in every color! Thank you for another lovely giveaway! Loving the Ranunculus floral cluster garden necklace. I love the Dots Modern Clay Necklace. What a great mix of modern and frilly pieces! wow, they are all just stunning! but i love the paper rose necklace in jade green. i love the paper rings! That Paper Ranunculus necklace is too insanely stunning for words. These are breathtaking! I think that these earrings are amazing!!! I adore the "Garden Roses Clay Small Bib Necklace In Oatmeal" - it's so gorgeous! I really like the purple daisy chain necklace. It's super cute! Wow. I never knew flowers could look so great and pretty! I really love the colour of Paper Rose Ring in Snow. The pale purple colour is just soooo irresistable! Hi Danni! Of course I follow your blog. =) I love the Secret Garden Bib Statement Necklace! It's so beautiful! I love the Paper Rose Necklace in Jade Green! Oh my goodness its all so pretty! Ranunculus are my favorite flowers, so I love the ranunculus necklaces. Garden Roses Clay Small Bib Necklace In Oatmeal!! so lovely! anddd i posted about it on The OC Gazette's facebook page! I love the Secret Garden Bib is beautiful. I love those colors and have so much I could wear with it. Thanks for a chance to win. I am a follower of your site. Loving the paper rose necklace in Jade green! My favorite is the Hinged Garden Roses necklace. gorgeous giveaway! My favorite item is the Classic Green Envy Pearl Necklace. i love the paper rose floral ring in plum! I am a fan on FB!!! I love it!!! Thanks! loovee this "Modern Elegant Necklace" so elegant! i am your blog follower and twitter follower too. Just one?? Ok I loooove the one as your profile pic on FB. the Secret Garden Bib Statement Necklace! Gorgeous!!!!!! I love the lipstick red paper rose ring. That is divine. All are lovely. Thanks for the inspiration! Enjoy the day. I shared on FB. (Janea Soliven). i liked the dots modern clay necklace. so gorgeous! Love the daisy chains necklace in green! so pretty! I just became a facebook fan!!! The stuff is so pretty! The Paper Ranunculus Rose Floral Necklace is so beautiful! I love ranunculus and featured them at my recent bridal bouquet. I wish I had known of this shop a few weeks ago! I am a fan on facebook and I shared the giveaway on facebook too. I love any of the Paper Rose rings, and the navy dots necklace! Gorgeous pieces! Everything is beautiful. Since I have to choose, I'm going with the Paper Rose Floral Ring Burnt Gold since I don't really dress up to warrant the statement necklaces. Oh my! Sooo gorgeous! I love the Hinged Bib Rose Garden Necklace!!! umm . . . I like everything. I think the Paper Ranunculus Floral Cluster Garden Necklace is one of the top favorites! I like the Dots Modern Earings. They are so cute! I like the Ranunculus Pendant in Coral Blush. Beautiful! I love the white paper Ranunculus necklace! So elegant! Thanks! I love the Ivory Pearls on a Pendant and the Athena Large Round Clay Pendant in Pear. Oh I adore the paper rose floral ring in plum! It's such a gorgeous deep color! I can't decide! Honestly she is so talented and I agree that she is a great photographer. I love the Paper Art Vintage necklaces. Gor-to the-geous! Definitely in love with the Secret Garden Bib Statement Necklace! All so beautiful, it's a difficult choice but I choose the hinged bib rose necklace. Thanks for the opportunity. My fav is the Secret Garden Bibb Necklace. It is sooooo beautiful. What a beautiful shop! Thanks for sharing! My favorite item is the Secret Garden Paper Rose Bib Necklace. Gorgeous! amazing! I love Paper Ranunculus Floral Cluster Garden Necklace! the hinge bibbed rose necklace is to die for!!!! My favorite has to be the Clay Bib Necklace Garden Roses. The purple one is so cute. It's all so beautiful...even her photos are gorgeous! I love the Dots Modern Necklace Tri Purples. These are breathtaking pieces of jewelry! My favorite is the Dots Modern Clay Necklace - I have quite a few dresses that this necklace would look absolutely stunning with! love her paper rose necklace in jade. gorgeous green! WOW! To have such talent - they are all so beautiful but a favorite of mine is - Secret Garden Bib Statement Necklace. Have you ever seen anything more beautiful1! I couldnt choose 1 favorite so I chose 2...lol Either the Paper Ranunculus Floral Cluster Garden Necklace or the Lipstick Red Paper Rose Floral Ring. Both are so gorgeous!! I love the Hinged Bib Rose Garden Necklace! love the paper and antiqued brass necklace! so pretty! I LOVE the Paper Ranunculus Necklace and Paper Rose Ring in Snow. Yowsa's! I love it all! She truly has a gift. My fav is the Hinged Garden Roses Necklace. So sweet. i love love love her paper rings. either plum, or snow. everything is gorgeous! omygosh how can younot just adore those paper ranunculas? My favorite is the Paper Art Vintage Style Necklace! oh wow, this is one of the most unique etsy shops i have seen in awhile! i LOVE the Daisy Chain Necklace! thanks for a chance to win! Definitely the hinged bib necklace. So beautiful. Thanks. I love the Ranunculus Pendant in Coral Blush. Thanks! I love this shop! My favorite is the dots modern necklace in purple- so unique! I love the Lotus Necklace in Grass and Coal! Favorite! And I love the Paper Ranunculus Floral Cluster Garden Necklace- in pink. So pretty! I like the navy dots modern necklace! I really like the classic green envy pearl necklace or the trapeze pendant with silver pearls.